As conventional religion has stopped meeting most peoples needs as a way to deal with the mystery and mortality of life in the past century, these needs have been nonetheless met by a new, albeit implicit, source. It seems that the new supreme deity is now science, with its promises of salvation with its statistical studies and inferences, which are treated like holy scripture, and are supposed to point the way to a longer, healthier, happier life. It is also to science people turn to explain the mysteries of life, and some think it has solved the fundamental questions. Indeed, science’s Darwinian creation myth is considered fact beyond question, and a bleak, material, random universe is the only explanation allowed in most serious, academic circles. Perhaps in this new century its time to stand back and take a philosophical approach to reason, science and statistics, and identify their strengths and weaknesses in the search for truth. I feel they are good at dissecting and determining the mechanics of the material world, or matter, but in terms of the subjective, spiritual realm and life’s most profound questions they fall terribly short. Its still to the great spiritual teachers and philosophers that one should turn for the answers to the great mysteries, and how to have the good, long life, and deal with the inevitable mortality of us all. It is time to put our faith and hope for salvation back where it belongs, and not give it all to the damn scientists. 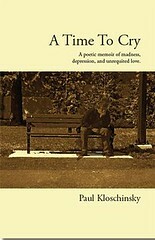 You can also check out my poetry, songwriting and photography at http://www.kloschinsky.com.